Dongfeng Race Team showed great concentration and resilience in winning the New Zealand Herald In Port Race in Auckland, New Zealand on Saturday. Conditions were extremely light, shifty and patchy on the Waitematā Harbour, making for plenty of lead changes over the course of the one hour race. Team AkzoNobel finished in second place, while early leaders MAPFRE completed the podium to retain the overall lead in the In Port Race Series. "It was very tricky, very difficult," said Dongfeng skipper Charles Caudrelier following the race. "We had a terrible start but there was so much happening during the first leg that it wasn't always good to be in the lead as you just showed the others where the light spots were. We were able to pick up on that and sail around the leaders. The race started in spectacular fashion, considering how light the wind was. MAPFRE positioned well to leeward of the fleet, was first across the line, with David Witt’s Scallywag barging through with speed ahead of a big group clustered near the pin end. But in fact, it was Team Brunel who were causing the pile-up at the pin, forcing three boats outside of the start line, with Dongfeng, Turn the Tide on Plastic and team AkzoNobel all required to re-start well behind the leaders. That left MAPFRE and Scallywag as the early leaders, charging up what appeared to be a one-tack leg. But as they approached the top third of the leg, the wind died, and the trailing boats were able to sail around the leading pair on both sides, with AkzoNobel and Vestas 11th Hour Racing squeezing through just ahead of Dongfeng Race Team and Brunel Sailing. 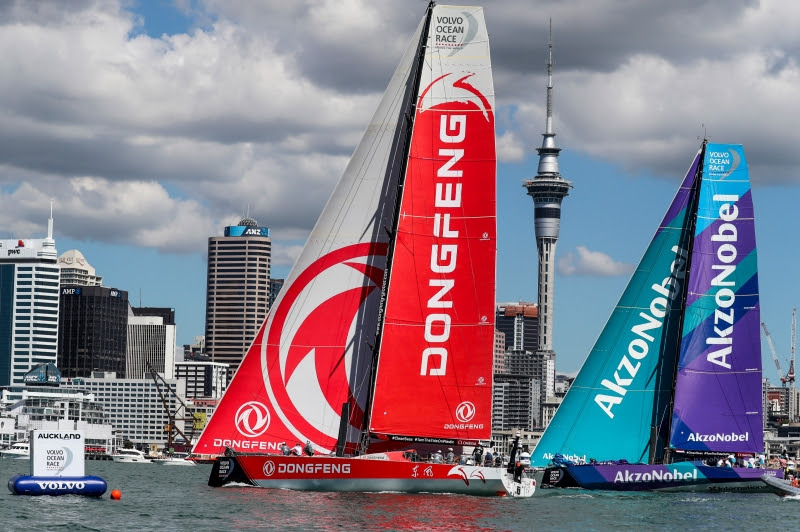 On the nominally downwind second leg, AkzoNobel and Dongfeng found a vein of pressure to grab the lead, and on a shortened two-lap course, it was Dongfeng who were able to ease ahead and hold on for the win. “It was a good team win,” said Caudrelier. “Very good for the mood of the team." The results mean MAPFRE retains the overall lead in the series, with Dongfeng reducing the gap to second place and team AkzoNobel leapfrogging Brunel to take third.